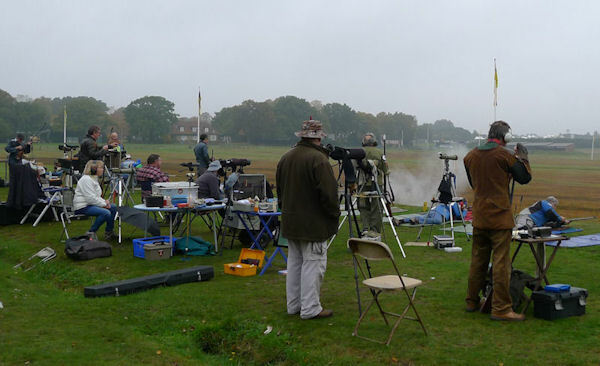 Thirty one Branch members gathered at Bisley on Saturday 29 October to compete in the final matches of the year, the Rigby Cup and Whitworth Cup. Each match comprises 15 shots at 600 yards, with either any muzzle loading rifle or hexagonally bored Whitworth rifles. When the Bisley siren announced that shooting could commence at 8:30am outlook was not particularly good. Gloomy conditions and a very fine misty rain hanging over the range gave poor visibility. Once shooting commenced the gun smoke lingered around before being gently wafted away. Target numbers were not readily discernible through the rifle sights and care had to be taken to avoid cross-shots, which are recorded as a miss (a frustrating and needless way of losing points – as the author knows from experience!). Some shooters adjusted to the conditions better than others and there were some fine scores recorded. It is also pleasing to report that Alan Beck and Henrie van Koot who won the Rigby Cup and Whitworth Cup matches respectively, did so using original rifles. This popular end of season event attracts members from England, Wales, Jersey, France and Holland and is concluded with the Branch Annual Dinner and Prize Giving.